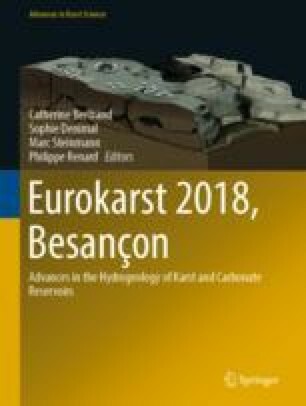 The analysis of natural responses (hydrodynamic, hydrothermal and hydrochemical) of karst springs is a well-established approach to provide insights into the hydrogeological functioning of the aquifers that they drain. However, a suitable monitoring program of these responses is often difficult to launch in poorly accessible streambed springs, due to the mixing between surface water and groundwater, in addition to topographic impediments. This work describes the installation procedure of the measurement equipment and the preliminary hydrogeological dataset collected at the Charco del Moro spring (Southern Spain) during one hydrological year (2016/17). This outlet emerges 5 m below water surface, at the bottom of a partially flooded 20–200-m-deep and 2-km-long gorge, eroded by the Guadiaro River streamflow. It is considered the largest discharge point in the region, draining groundwater from northern nearby carbonate outcrops, although its catchment area is not established yet. Continuous (hourly) monitoring of electrical conductivity, water temperature, turbidity and water level (discharge) reflects a high degree of heterogeneity in the duality of groundwater flow and storage dynamics, which is typical of karst conduit flow systems. This study was carried out under the CGL2015-65858R project and to the Research Group RNM-308 of the Junta de Andalucía. The authors thank Raúl Cerezo, Paloma Carrasco, Marianna Mazzei and Daniel Montiel for their help during installation of devices.